The HKSSC is an industry-led coalition, comprising of members from Hong Kong’s seafood industry including suppliers, buyers, restaurants, hotels and retail outlets. The short-term objective of the HKSSC is to develop Voluntary Codes of Conduct on seafood sourcing and environmental claims on packaging and menus. Following the creation of these codes, its members may further reengage with existing or new initiatives to ensure that seafood sourced is sustainable and not illegal, unregulated and unreported. Low consumer awareness of seafood sustainability and related issues. In May 2017, ADM Capital Foundation and Teng Hoi organized a Symposium (Safeguarding Seafood for our Future), supported by the Swire Charitable Trust, to engage the local seafood industry, specifically with the aim of identifying how to address concerns over Illegal, Unregulated and Unreported fish products in the supply chain. A key outcome of the Symposium was broad agreement amongst participants to develop industry led voluntary sourcing codes along similar lines to the UK Sustainable Seafood Coalition’s Codes of Conduct. The Hong Kong Sustainable Seafood Coalition was developed to take this initiative forward. For its first two years, the Coalition’s activities are facilitated by a Steering Committee, comprising of ADM Capital Foundation and Teng Hoi Conservation Organisation, with CSR Asia, as the Secretariat. Supported by a Technical Advisor, Jacqui Dixon, the issues discussed are non-competitive, in line with Hong Kong’s competition policy, and legal advice is sought to ensure that the coalition does not breach any anti-competitive laws. Member meetings are managed according to transparency and are subject to Chatham House Rules, such that meeting minutes are publicly available via this website, but contents are not attributed to speakers. 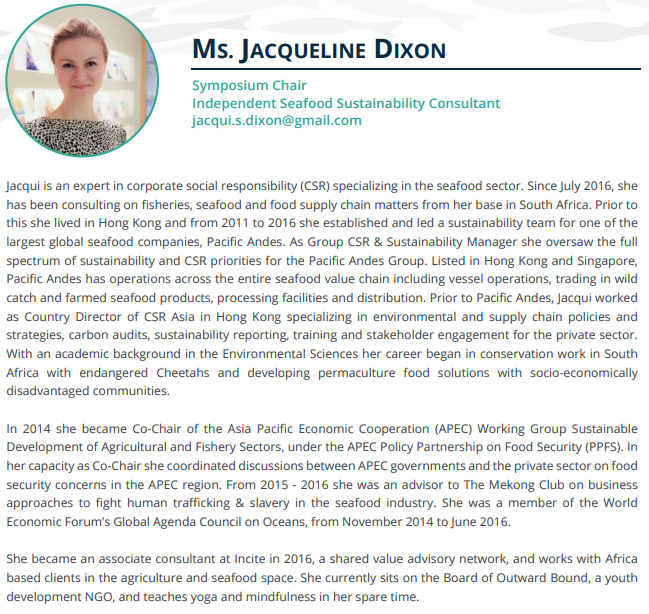 We would also like to thank the Sustainable Seafood Coalition in the UK for their support and for allowing us to adapt their Voluntary Codes of Conduct for the Hong Kong market.